Alan Moores long awaited Glory has finally come to Avatar and this amazing #0 issue is one you will not want to miss! 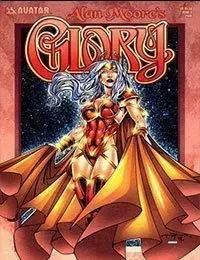 This full size, full color book features the highly coveted 10 page introduction to the story by Alan Moore and Brandon Peterson along with an all-star art gallery chronicling the key events that have shaped Glorys life. This stellar line up of talent is not to be believed, featuring Joseph Michael Linsner, Matt Haley, Ron Adrian, Marat Mychaels, Karl Waller and more! This vital prelude to the new Alan Moore Glory series is also the perfect introduction to the world of Glory for new readers.